It seems to be common knowledge that Chinese are not traditional consumers of milk and dairy products. If Chinese consume dairy products at all, they are mostly formulated products. This is not quite true. First of all, apart from the Han Chinese, China has a number of national minorities of whose cuisines milk has been an important ingredient for centuries. These products have been introduced in Chinese cuisine in areas where their cultures mixed with those of Han Chinese. The emperors of the last dynasty, the Qing Dynasty (1644 – 1911), were not Han Chinese, but Manchus whose dairy products became part of the court cuisine. Westerners introduced their dairy products, when the first settled in the coastal regions of China. Although Chinese indeed found it hard to learn to appreciate those strongly smelling products, some amalgamation has taken place. It should not be a surprise to learn that the people of Guangdong, in particular of the Pearl River Delta, have developed a number of dishes with milk as the main ingredient. Also see the paragraph on mantou (steamed bread) as dessert in my blog on steamed bread. Milk is mixed with egg white. Then fried ham or other meat shreds are added and the milk is fried in peanut oil. It can be prepared salted or sweetened. Press juice from ginger and put one spoon of ginger juice in a bowl. A little more will produce a slightly sharper taste, but the volume should not exceed three spoons, lest the flavour of the milk will be covered. Milk is slowly boiled with sugar. The sugar should be equally dissolved. The boiled milk is poured into a larger bowl from a certain height; this should be repeated seven times. The milk is then poured over the ginger juice and the ginger milk can be consumed after 3 – 4 minutes cooling. Milk is boiled with sugar and tea. We use the word ‘cheese’ here in English, because the Chinese word nailao is currently used to refer to Western cheese. The traditional cheese was introduced in the Northern Chinese cuisine by the Manchus, who ruled China during the last dynastic period. Wine culture and sugar are added to fresh milk and distributed in bowls. The bowls are heated on hot ash and then cooled by ice, which caused the milk to set. A wowo is a traditional Chinese type of small pyramid shaped bun. Milk wowos and milk rolls are prepared by wrapping milk skin around a sweet filling, like sesame paste, sweetened bean paste, haw thorn paste, etc. The main difference between the two actually is their shape. Milk is a core ingredient of the Mongolian diet. Besides cow milk, goat, mare and camel milk are also consumed. However, apart from fermented mare milk, most Mongolian dairy products are made from cow milk, as it has the best clotting properties. Fresh milk is sieved through cloth into a vessel an put aside for one or two days in summer, up to three to seven days in cooler seasons. The fresh milk will start clotting by itself. The clotted milk is softly boiled in warm water, while the whey is slowly pressed out. 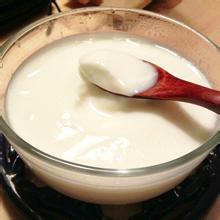 The resulting curd is kneaded with a spoon or a wooded vessel until an even sticky substance is formed. During the kneading, sugar can be added. The milk is then put in wooden moulds and dried in the sun. The resulting milk bean curd is cut into small strips. The process is the same as for milk bean curd, but without the kneading. Sheep milk is normally used for naizha, as cow milk naizha is not easy to chew. Curdled milk is wrapped in cloth and pressed using a stone. The resulting solid is called raw cheese. Using milk clotted by boiling (after removing the skin) is called cooked cheese. Cheese is cut into small flakes and sun dried. Naigeda can be regarded as a kind of cheese. Milk is fermented, heated and then sieved through cloth. The resulting mass is kneaded into small pieces of various shapes. Cooked yoghurt is pressed in the same way as cheese. The result is called yoghurt crisp. Cut into small pieces, again in the same fashion as cheese, it is referred to as sour cheese (suanlao). It can be kept for a long time and is said to relieve indigestion. A number of the traditional dairy products introduced above are going through various degrees of (semi-)commercial production. 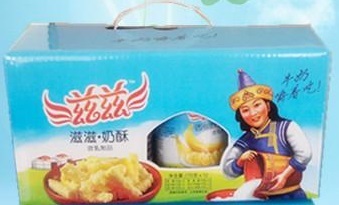 The Mongolian dairy products have recently become a genuine vogue in Beijing. More and more Mongolian restaurants are opening and placing plates and bowls with Mongolian dairy products on the table is a typical way to greet a group of guests. 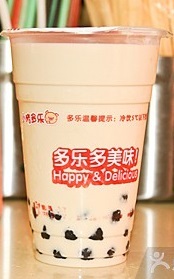 While this can still not be considered real commercial production, Duole Dairy Co., Ltd. (Guangzhou, Guangdong) has launched milk tea packed in plastic cups. It is interesting to see that the Cantonese, who were the most inventive in incorporating milk in their local cuisine, are now also the first to come up with a industrially produced version. It is advertised as prepared with fresh and natural ingredients, quench thirst and relieve fatigue. Ruiyuan Dairy (Xinjiang) is producing naigeda on an industrial scale. The company has two patents for this new process. The ancestors of the engineer who formulated this product would be less impressed, but then, they did not face the challenge of large scale production. This entry was posted in Uncategorized and tagged China traditional dairy products cheese by eurasiaconsult. Bookmark the permalink.